In 1731, an English botanist received a dried herbarium species from New Providence in the Bahamas. "The tuber appearing to have life in it," he potted and carefully nurtured the plant. It revived, and the next year brought forth handsome pink- and rose-colored flowers. This was Bletia purpurea. The name and date are worth noting, for this was the first tropical orchid to flower in England, foreshadowing a mania for orchids that nearly rivaled the tulip madness that swept the Netherlands during the 17th century. .... A tall, slender stalk leads to an exquisite flower composed of three inner petals, three outer petals, and a cupped petal distinct from the rest. 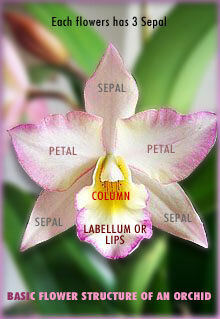 Labellum, inflorescence, sepalthe names of the anatomical parts sound as fabulous as they look. The whole exotic composition is almost alien in appearance, extravagant in the extreme, yet possessed of a delicate intricacy. Orchidaceae is arguably the most stunning and elegant family of flowering plant known to man. For millions of years, the orchid family has thrived and expanded, defying evolution, Mother Nature, and the exploitation of its greatest opponentMan. One hundred and twenty million years ago, when dinosaurs roamed the earth, a magnificent flowering plant came into beingthe orchid. Evolution led to the demise of many plants and animals, but the orchid flourished, thriving on every continent save Antarctica. Orchids have adapted to live in all kinds of environmentsmountains, bogs, grasslands and rainforests. At least 35,000 orchid species now populate the planetand there is always the possibility that unknown species still await discovery. Orchids attract pollinators for reproduction by several ingenious methods: scent, mimicry and stealth. Orchids with sweet scents usually attract bees; those with a rancid smell lure flies. The orchid can also draw pollinators through visual mimicry, imitating insects including bees and butterflies with the patterns on its petals. A third technique is stealth. The slipper orchid lures a prospective pollinator to the edge of its slippery pouch, and the insect falls in. When it finds the single exit, it brushes against the pollinia. Some orchids are pollinated by crawling insects, and thus have long petals that brush the ground. And insects alone do not pollinate orchidssmall mammals, hummingbirds, bats and the wind also contribute to the survival of the species. For centuries, the orchid has been a symbol of love, luxury and beauty. To the early Greeks, the orchid represented virility, and the Chinese called it "the plant of the king's fragrance." During the Middle Ages, the orchid was considered an aphrodisiac and was used in love potions. Serious orchid collecting began in the 18th century, but because of their rarity at the time, only a few botanists and wealthy amateurs could enjoy them. In 1818, William Cattley became the first person to bloom an orchid (the Cattleya, top photo), an event that changed the flower world forever. Forests were stripped of millions of orchids, putting many on endangered species lists. A single orchid sold for thousands of dollars. This practice has since been banned, and species are now bred and cultivated specifically for sales. What will the future bring for Orchidaceae? Its greatest challenges are now those imposed by Man. Will our environmental blockades prove overwhelming? Or will the orchid's resilience, tested over millennia, outlast even our own? In spite of the obstacles to its survival, the orchid will retain its elegance and prehistoric mystery in the minds of all admirers. A. 60 feet above the ground, this cattleya skinneri is happily blooming profusely. B. Sophronittis grandiflora - a native of Brazil, is attached to piece of bark. C. Dendrobium Species in the rain forrest of the Philippines - as they rest during their "resting period." D. A single fower of Ludisia discolor, a native to Asia, sitting on top of a Phalaenopsis Hybrid.